Don’t underestimate the importance of the Senkaku/Diaoyu islands to Japan…or the importance of Japan to the US. I stand corrected by Professor Paul Sracic’s scholarship and experience in U.S. law and politics with regard to U.S. President Barack Obama’s legal considerations behind his actions regarding the no-fly zone in Libya. (I did raise the possibility of a case in which such prior authorization would not be feasible, but that was never a focal point of Professor Sracic’s original argument nor the main thrust of my counterargument, so I will leave it at that.) I shall also accept his assessment that “[i]t seems foolhardy to ignore this increasingly significant ‘creeping isolationism’ in U.S. politics when trying to predict the actions of Congress, whether one is talking about the Middle East, or the East China Sea.” And I shall concede the “the insignificance of the islands in the eyes of most Americans.” However, the Senkaku Islands are much more than just “a set of uninhabited islands to the south” to Japan. The Senkaku Islands have only minimal economic value to Japan with regard to the seabed resources in the surrounding exclusive economic zone, the current situation being as it is. But there is a practical reason for maintaining administrative control over the islands, for the islands do have some potential as a military outpost. No Japanese administration has suggested such use, and is highly unlikely one would do so regardless of any wishes that the Japanese hard-right may harbor. However, the Japanese government will want to keep the islands out of Chinese hands for security purposes in light of the latter’s actions to secure disputed territory in the South China Sea, if nothing else. The importance of the islands has been enhanced by the ongoing shift in Japan’s post-Cold War national security policy and deployment of its military assets: specifically, less emphasis on the U.S.S.R. (and later Russia) and more on North Korea and China and the safety of its sea lanes – a trend-line that was already in place when Shinzo Abe first assumed office as prime minister in 2006. Also important from a political perspective is the symbolic value that they have acquired. This is largely a reflection of China’s assertion of its own territorial claim since it declared it in the late 1960s, an assertion whose aggressiveness has escalated dramatically in recent years. This has raised the profile of the islands and the dispute surrounding them among the political class and, to a lesser extent, in the eyes of the Japanese public. And if there is anything that unites parties across the political spectrum, including the Japanese Communist Party, it is the belief that those islands belong to Japan. And yes, I said “dispute,” whose existence the Japanese government denies. In fact, the Japanese government has never said that there is no dispute over the islands. What it actually is saying that“there exists no issue of territorial sovereignty to be resolved concerning the Senkaku Islands. Then what is the Japanese government’s position regarding the resolution of the dispute? It is implicit in a comment by Abe at the 2014 Shangri-La Dialogue that “whether a submission to the International Court of Justice should be made or not is what China, who is challenging the status quo, should consider. But I digress. Given their growing significance as a national security asset and political symbol, it is unthinkable, at least to me, that any Japanese administration could concede control of the islands without putting up a fight, leaving decades of consistently evolving defense policy in tatters, and still hope to survive politically. Instead, it will certainly attempt to repel any effort to seize administrative control over the islands. Finally, I would like to counter Professor Sracic’s question “Will Japan want to risk losing the protection that the Mutual Defense Treaty offers to Tokyo because the Congress refused to extend it to a set of uninhabited islands to the south?” with my own: “Will Japan trust the protection that the Mutual Defense Treaty offers to Tokyo if the Congress refuses to extend it to a set of uninhabited islands to the south whatever its relationship with the White House may be?” More specifically, can Japan trust that the United States will assume the risk that extending its nuclear umbrella entails if the latter is not even willing to risk its military assets thousands of kilometers away in a conflict using conventional weapons (presumably)? 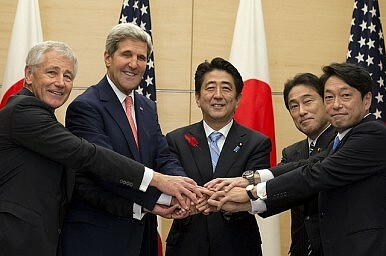 And will the U.S. Congress test the resolve of the Japanese government at the risk of its military assets on Japanese territory by denying the president authority to provide direct military support to the latter’s efforts at self-defense? Of course sovereign states have violated treaties when it finds it advantageous to do so. However, such action will generally be heralded by a much broader discord between the parties concerned. I do not see that happening any time soon between the United States. Still, Professor Sracic’s voice is enough to sow the insidious seeds of doubt in my mind. So let me downgrade my assessment of the likelihood of U.S. inaction to: Very, very unlikely. Finally, note that Professor Sracic and I are not that far apart, as he himself has mentioned. He is mindful of the consequences of a potential breach, while I am aware of the Japanese need to stay on the good side of the U.S. Congress. Hopefully, the issue will remain unsettled forever. Jun Okumura was formerly with the Japanese Ministry of Economy, Trade and Industry and is now a visiting scholar and columnist at the Meiji Institute for Global Affairs (MIGA). He also blogs at Global Talk 21. Some possible inspiration that might help the two leaders get China-Japan relations back on track.